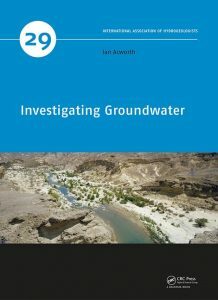 We are delighted to announce a new book title Investigating Groundwater by Ian Acworth, Emeritus Professor at University of New South Wales. It is the latest in IAH’s International Contributions to Hydrogeology (ICH/blue book) series. Investigating Groundwater provides an integrated approach to the challenges associated with locating groundwater. It provides a review of the wide range of techniques that can be deployed to investigate this important resource. Many of the practical examples given are based upon Australian experience but the methods have worldwide applicability. The book is published in colour and includes many original diagrams and photographs. Particular effort has been made to provide consistent terminology and SI units are used throughout the text. Written for a worldwide audience of degree level geology/engineering practitioners, academics and students involved in groundwater resource investigation methods, Investigating Groundwater is essential reading for those working in groundwater research.